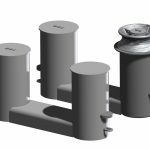 More performance for less weight makes working with original POOL® Anchors efficient and comfortable. All POOL® Anchors are easy to handle. The crew saves time because the anchors are balanced; damage to the hull is kept to a minimum and the anchors can be drawn easily into pockets. POOL® Anchors are available from 8 to 26.000 kilograms. 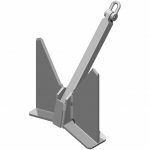 All types are qualified as a High Holding Power anchor – you benefit from a 25% weight saving in comparison to a conventional anchor. THR is a partner for your crew. That is why we are able to deliver literally every part of mooring equipment. Why our engineers are pleased to help you to determine the ideal configuration on deck. That is the only way we can assure the quality at the level you expect from us.